Strik isn’t alone in her condition. Allergies and asthma affect many Canadians — eight percent of Canadian adults and 12 percent of children are asthmatic. The onset of symptoms — mainly a constricting of the airways and difficulty breathing — can be triggered by any number of irritants, such as animal dander, dust, air pollutants and mould. And all these hidden dangers can be found under the roof of the typical Canadian abode. Homes can also be host to a number of hazards that can affect anyone, regardless of their sensitivity to environmental allergens. Fumes from chemicals and finishes can trigger headaches and nausea, and have been linked to chronic fatigue syndrome and even attention deficit disorder (ADD). To fight this onset of illness and to establish a better quality of life for homeowners, the Canadian Mortgage and Housing Corporation (CMHC) has established the Healthy Housing Recognition Program, a standard bestowed to builders who meet the five key elements: Occupant Health, Energy Efficiency, Resource Efficiency, Environmental Responsibility and Affordability. And over the past decade, builders have risen to the task, becoming increasingly educated about indoor air quality (IAQ) and occupant health. Prospective homebuyers have also been doing their homework. “The building codes have changed immensely, and our homeowners have changed immensely. They’re more knowledgeable. There’s more print for them to read, and really, they’re trying to protect their investment,” says Strik, who has been in the custom building business for 23 years and has received the Healthy Housing recognition, as well as being named the Canadian Home Builders’ Association’s SAM Green Home winner in 2009. Danger can also lurk on the walls themselves. Paints and varnishes used in older homes often lead to trouble. “A lot of these old houses have lead paint,” says Strik. “We’ve had to address that in a lot of cases.” She adds that an air exchanger is also a must-have. “An air exchanger will always bring in fresh air and expel the stale air, and that alleviates moisture issues,” she says. Barkhouse says that in addition to using zero or low off-gassing finishes in paints and coatings, the phasing out of disposable materials and cheap furnishings have also contributed to an increase in air quality. Material manufacturers have also risen to the occasion, with virtually every paint brand offering low VOC (volatile organic compound) and water-based products. Building a mould-resistant home from scratch may be an ideal option, but how about those current homeowners who realize the air quality is subpar or locate mould behind the baseboards? Aside from packing their bags, renovation is often the answer — making this issue of a healthy home a lucrative area for renovators as well. Herb Lagois, president of North Gower-based Lagois Drafting and Construction, says proceeding without the help of a professional is out of the question, which should make this niche of particular interest to qualified renovators. 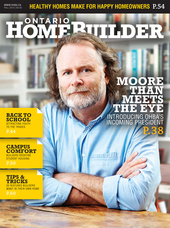 “A professional could be a renovator, a heating/cooling contractor, an independent IAQ consultant — the key is making sure the individual or firm has the knowledge to deal with the issue,” he advises consumers, emphasizing the need for professionals in the industry to get up to speed on the healthy home trend. Thinking “green” is not simply about the larger environmental impact, but thinking more locally as well. Homeowners are more likely to have their interest piqued when you speak to them about issues that directly affect their family — maybe they won’t be sold on energy-efficient HVAC systems, but talk to them about how they can help control their children’s allergies and now you’ve got their attention. The Healthy Housing Recognition Program was developed by the CMHC not as an award, but as a way to recognize builders who adhere to standards developed to increase the quality of life for all Canadians, as well as contribute positively to the environment. There are now over 50 Ontario-based custom builders and contractors who meet the requirements. Over 2.3 million Canadians are asthmatic — 8.4 percent of adults and 12 percent of children. Asthma can be triggered by physical overexertion, anxiety and biological pollutants, both natural and chemical. Even smells, especially noxious odours, have the ability to trigger asthma attacks. Banish formaldehyde: It might be a no-brainer to avoid such a toxic chemical, but many plywood kitchen and bathroom cabinets contain it. Hardwood cabinetry is always a wise investment. In-floor heating: This can really help make up for that lack of carpets, and can go a long way toward increasing energy efficiency. No carpets allowed: It may be lovely to have a plushy feel underfoot, but carpets are chock-full of irritable baddies. To qualify for the Healthy Housing recognition, homes must have hardwood on 75 percent of the floor area, and be accompanied by a low-level emission softwood subflooring. Keep moisture at bay: Accumulating moisture over time leads to the breeding ground for all sorts of nasty air pollutants, namely mould. Counter cultures by ensuring homes are built with a concrete shell, foundation exterior insulation and an effective drainage layer. Keep it flowing: Out with the old, in with the new — an air exchanger is a must-have addition to any home. Not only will you avoid recycled air full of allergens and dust, you’ll strengthen your defence against moisture buildup. Avoid chemical burnout: Ensure the existing paint is lead-free, and always use products with low VOC levels and that are water-based. Don’t get stuck: Ensure all sealants used in the home are non-toxic, including those used on furniture. Efficient furnace filtration: This can drastically reduce exposure to harmful particles and dust. Choose an electric stove over gas: This will cut back on the amount of combustion gases in the home, and will help in avoiding dangerous levels of carbon monoxide. Vacuum — very frequently: Carpets are a safe haven for dust mites, skin cells and bacteria. Ensure your vacuum is equipped with a high-efficiency particulate air (HEPA) filter, and use it on both hardwood and carpeted areas. Beware your bed: The big fear here are dust mites, which create their habitats within mattresses and pillows. Encasing mattress in a cover will help keep dust mites out — and those who’ve already moved in to stay put. Also be sure to change sheets and covers frequently. Invest in an air purifier: While it’s most effective to locate the source of contaminants and remove them, cleaning the air can keep symptoms at bay short-term. Avoid ozone-creating filters as their effectiveness is not proven (and can also be an irritant in themselves). Kick cockroaches to the curb: This pesky critters are especially notorious for carrying symptom-triggering allergens. If they’re spotted in the home, remove all access to food sources immediately. For additional help, consult the CMHC’s Farewell to Cockroaches manual.